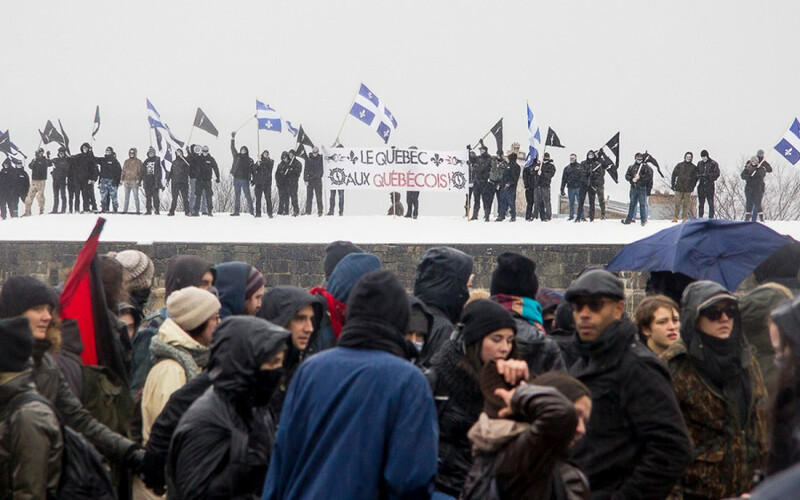 Far-right groups in Quebec have become more prominent, with social movements and protests becoming more common place in Montreal and Quebec City. Note from the editor: After a complaint was sent to the Conseil de presse du Québec, The Link would like to apologize for the way in which this article was executed. The intention was not label or imply the Parti Québécois is a far-right group, but it’s understandable that readers could have reached that conclusion by reading the article. However, these groups don’t exist in a vacuum. Racist ideologies and secularism have been promoted by Quebec politicians, manifesting in policies like the Quebec Charter of Values and bans against burqas and niqabs, impacting minority groups and immigrants across the province. When US President Donald Trump took office, applauded by the Grand Wizard of the Klu Klux Klan and other far-right groups, American policies began to become more more rigid against immigrants, generating a spark in anti-immigration protests in Quebec. The Parti Quebecois proposes Bill 60—which would ban all public workers from wearing religious symbols—such as the niqab, kippah and turban. Bill 60, also referred to as the Quebec Charter of Values, posed amendments to the Quebec Charter of Human Rights and Freedoms. The bill is later dropped in 2014 as the Quebec Liberal Party was elected. At the beginning of November and following the announcement of Bill 60, the Quebec Collective Against Islamophobia announces that reports demonstrate a 300 per cent growth in complaints of anti-Muslim attacks in the province. The proposal for the Quebec Charter of Values is terminated with the win of the Liberal party, as PQ Head Pauline Marois loses her seat in the riding of Charlevoix-Côte-de-Beaupré to Liberal opposition Caroline Simard. La Meute, an anti-Islam far-right group promoting anti-immigrant sentiments is founded in the fall of 2015 by war veterans Eric “Corvus” Venne and Patrick Beaudry, around the same time of the arrival of 25,000 Syrian refugees in Canada. A pig’s head is left by at the door of the Centre Culturel Islamique du Québec, a mosque in Quebec city. The hate incident is likely committed by members of La Meute, who discussed how to do it online in the months prior. Far-right groups amass in front of the National Assembly in Quebec City to protest the perceived rise of the Islamic faith in the province. The far-right group Justiciers du peuple organized the protest, with other far-right groups like PEGIDA Quebec, the Soldiers of Odin, La Meute and Atalante Québec joining in. As the far-right groups marched blocks from the National Assembly, anti-racist counter-protesters waited for them. Donald Trump wins the U.S presidential election. Former Ku Klux Klan Grand Master David Duke tweets his support stating, “We did it!” The next day, hundreds protest in Montreal. The Muslim Student Association at Dawson College holds an event in November, inviting students to try wearing a hijab for Islamic Awareness Day. 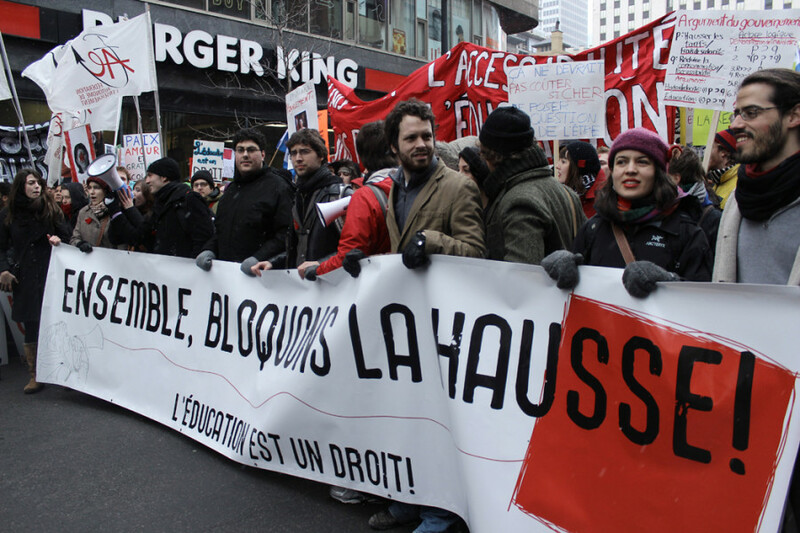 Following Le Journal de Montreal’s coverage of the event, members of La Meute take to Facebook to encourage members to condemn the event by contacting the CEGEP’s administration. Despite none of the complainants revealing their identity, a Dawson spokesperson said she had never received such a large volume of complaints during her 15 years there. 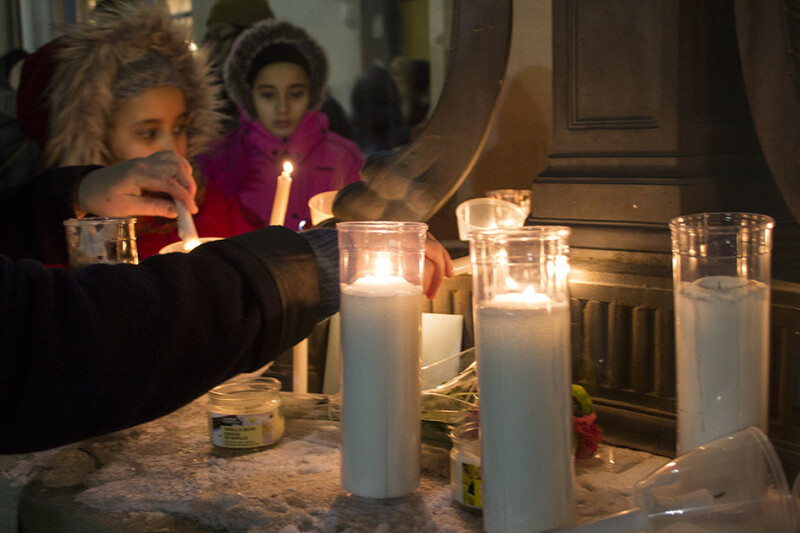 Six Muslim men are killed inside the Quebec Islamic Cultural Centre, and 19 are injured. It was later exposed that suspect Alexandre Bissonnette was involved in far-right activism on social media, inspired after France’s National Front leader Marine Le Pen visited Quebec City. Far-right supporters and anti-fascists go head to head in front of Montreal’s City Hall in light of the federal government’s proposal of Bill M-103, which condemned Islamophobia in Canada. 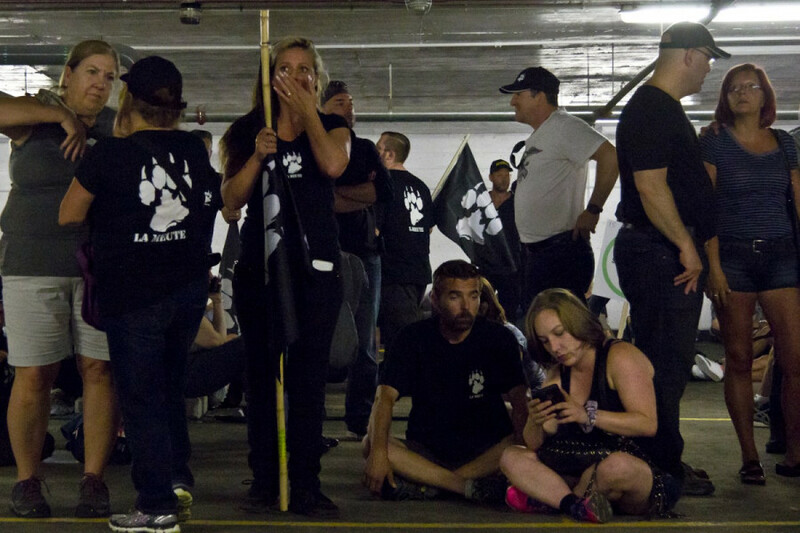 Opponents critique it for restricting “freedom of speech” and promoting “Sharia law.” The most prominent presence within the far-right supporters are from La Meute—also known as The Wolfpack—flaunting apparel and flags donning a their paw print logo. Motion M-103 is passed by the House of Commons, initiated by the Liberal party of Quebec. Far-right groups Storm Alliance and La Meute gather at the Quebec-New York border on Roxham Rd. in Hemmingford, Qc to protest the entry of migrants. Counter-protesters refute both far-right groups, the Royal Canadian Mounted Police and Sûreté du Québec officers create a barrier between both sides. A group of approximately 100 white nationalists flock to the University of Virginia in Charlottesville, where they march in a Unite the Right rally. This event is held before a protest against the removal of a confederate statue located in a Charlottesville park. A fight breaks out as a peaceful group of counter-protesters stand around the statue. The fighting continues the next day when Heather Heyer, a 32-year-old woman, is killed by a car driving into a crowd of counter-protesters. A solidarity rally is hosted in Montreal in support of Charlottesville anti-fascists, denouncing white nationalists, and protesters march from Phillips Square to the U.S Consulate. A large tribute is paid to Heyer as many carry signs with her photo and name on them. La Meute is faced off with hundreds of anti-racist protesters in Quebec City, after they come to demonstrate against the influx of immigrants in Quebec. That day, La Meute calls on Prime Minister Justin Trudeau and Quebec Premier Philippe Couillard to enforce border security, prohibiting “illegal immigrants” from entering through Quebec. While awaiting La Meute, anti-fascist counter-demonstrators clash with police. Following the demonstration held in Quebec’s capital, Quebec City Mayor Régis Labeaume says Quebec political leaders need to open their eyes to the rise of the far-right groups within the province. As of that date, more than 43,000 people were listed as members of La Meute’s private Facebook group. The Quebec National Assembly adopts a renewed version of the Charter of Values, Bill 62, which would ban face coverings for those who provide and receive public services. This time the law is introduced by the Liberal government. While the bill doesn’t limit Quecebers from wearing turbans or hijabs as the original Bill 60 required, it still bans the wearing of niqabs and burqas. 160 community organizations and thousands of people within the province participate in a march against racism in downtown Montreal. The protest also condemns the rise of the far-right groups in Quebec. 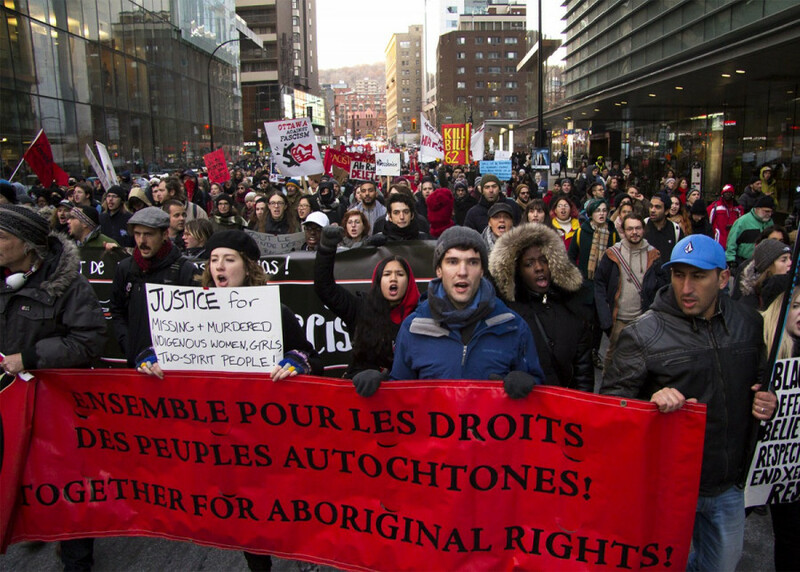 La Meute and Storm Alliance protest against the Liberal government’s attempt to hold a consultation into systemic racism in Quebec, despite the fact that the consultation had already been cancelled. Quebec City statistics show a spike in hate crimes in the year prior to the mosque shooting that took place in January of 2017. Police-reported hate crimes rose in the province’s capital, going from 3.5 to 7.1 incidents per 100,000 people between 2015 and 2016, according to Statistics Canada. These rates are higher than in Toronto, Ottawa or Montreal.